Star Ocean: The Last Hope has a great combat but fails to compensate for disturbing characters, awkward story and restrictive exploration. I found very little in its miniature worlds worth reflecting on. 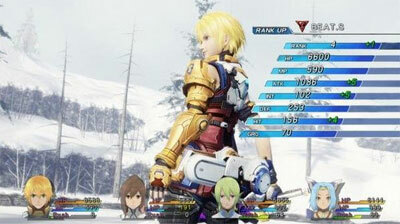 The Last Hope is a prequel to previous Star Ocean games. In it you search for humanity's new home following global irradiation caused by World War III. The introductory sections were so camp I had trouble taking them seriously. 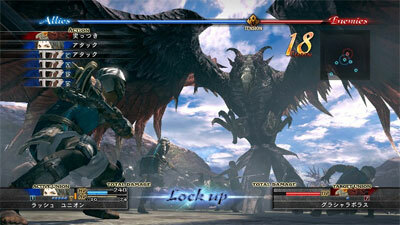 This feeling subsided, but the game continued to suffer from its committment to standard JRPG mechanics and tropes. I was hoping for a real feeling of exploration and discovery as I set out to find new habitable planets. As someone interested in recreated worlds this was a promising premise. Unfortunately, the linear, repetitive voyaging was restrictive and uninspired. The environments were not open or varied enough to give me a true sense of adventure. Although there is an obvious effort to vary each planet - from verdant greenery to snow and icy lakes - the diversity is superficial. Also, the frequent re-coloured enemies were particularly disappointing, as they produced an overly strong common link between supposedly distinct worlds. Each element of Star Ocean is disconnected. Exploration is broken up by the transition to a separate combat arena - signaled by both music and loading screen. After combat the characters gloat and pose while experience is being rewarded. In the frequent minor combats more time is often spent on this rigmarole than on the actual battle. It's a standard formula, but no less jarring and unnecessary. Even important social interactions are kept well separated from the rest of the game through distinct sections of dialogue choices. It makes the game incredibly difficult to connect with. All these disparate elements could have been so much better integrated. There is also a huge distance between save points - it just isn't a friendly game to play. Massive cut scenes left me twiddling my thumbs, sometimes for the best part of half an hour. Thankfully these are skippable, which replaces the scene with a quick text summary. At least someone must have been aware they were pushing the limits of tolerance for non-interactive scenes. There is also a huge distance between save points - it just isn't a friendly game to play. The story alternates between predictable and incomprehensible, and interactions are often based more on building tension than any kind of logic. I boggled at the situations, unable to understand or relate to the characters at all. When I did understand the logic of an interaction I felt like the game considered it strange. Early on I encountered a discussion about the first contact between humans and the Eldarian aliens. There was a lot of distrust and racism to overcome, and my natural inclination was to apologise for the issues caused by narrow-minded humans. Although this was probably the intended response the characters reacted as though it was a very strange thing to do. My Australian bias may really show here, but the concept of apologising on behalf of my race is a very familiar one. I grew up surrounded by debates about whether we should apologise to Aboriginal people for the previous forced removal of indigenous children from their families. 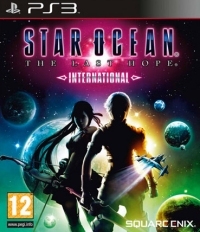 To me apologising was a very natural reaction, but Star Ocean seemed to be laughing at me for it. It was presented as the sort of thing only a young and overly idealistic captain would do. Sadly, she suffers from being the obvious potential love interest, and therefore needs periodic rescuing. The characters are rather creepy, if predictable. The protagonist Edge Maverick is yet another spiky-haired chosen one. He is also quite unstable, and ranges from arrogant to insecure. Reimi is his Second in Command, and would actually make a more consistent leader. Sadly, she suffers from being the obvious potential love interest, and therefore needs periodic rescuing. I spent a large proportion of the game referring to one of the characters as 'Jiggle Physics' because she hadn't introduced herself yet and it was painfully obvious which anatomical feature her designers considered most important. All of this pales in comparison to my irritation at the little girl who ends all her sentences with "Kay?". The major advantage of the PS3 International version is actually the ability to switch to the original Japanese language track. 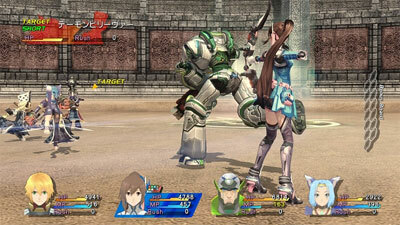 Star Ocean's silver lining is its combat system. After a bit of getting used to, the twitch reflexes required created really enjoyable real-time battles. All the characters play quite differently, which adds great variety. It was presented as the sort of thing only a young and overly idealistic captain would do. There are incentives to use the system skillfully instead of button mashing, particularly collecting bonuses that add to extra experience, money or other benefits. There is also an involved item creation system, and plenty of challenges for completionists to get absorbed in. 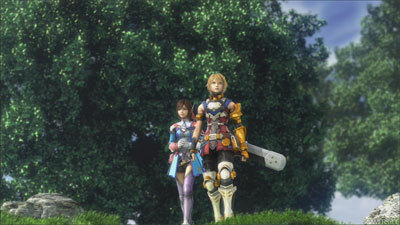 The positive and deep elements of Star Ocean are far overshadowed by the flaws in its story, characters and environments. My usual tendency to really become immersed in the microcosm of a game world was subverted by cliches and painful moments, as well as the lack of integration between different game elements.